Fixed at this position in the desktop clock is very useful, since the clock is thus fixed, so as not to inadvertently change the position of the clock! By activating the option Fixed at this position (... see Image-1 Point 1) , the desktop clock no longer reacts to the mouse and -the objects behind it, for example, the desktop icons- are accessible. 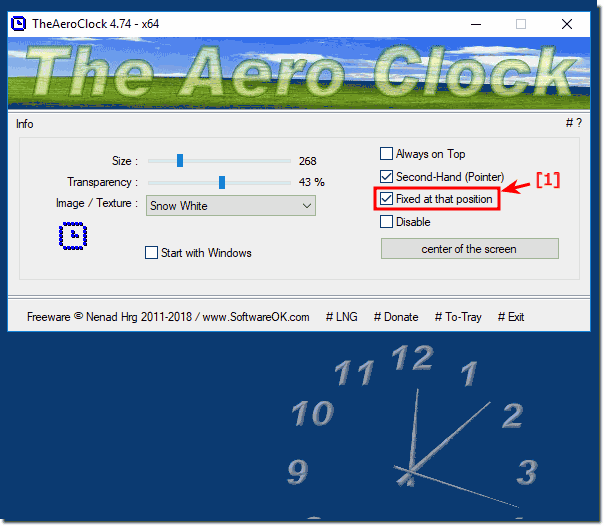 Please use always: ... the latest version of The Aero Clock for Windows! Desktop Clock, feel free to place it on the desktop! Of course, you can place the desktop clock anywhere you want on the desktop, you will not be patronized by the clock program and you can place the clock anywhere on the desktop and, if necessary, reposition it better. Until you are absolutely satisfied where the desktop clock disturbs the least but still discreetly draws attention to the current time. See also: ► How do I change the position of the desktop clock? (Image-1) Fixed at this position the windows desktop clock! You can use this example to fix on the clock on desktop, as a solution without hesitation on other versions of Microsoft's Windows operating systems, regardless of whether it is a Windows desktop, tablet, Surface Pro / Go, or even an MS Web Server operating system , Sometimes it really makes sense and even a great advantage to place this desktop clock so that it can not be moved unintentionally! TheAeroClock - FAQ-7: What is -fixed at this position- in the desktop clock?